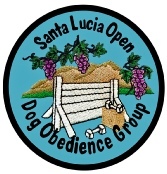 Many SLODOG members train and compete in Agility. Some members practice Agility locally purely as a recreational sport. There are also local matches and trials in the county if you would enjoy watching dogs run, |ump, weave, tunnel, seesaw and fly over the A Frame & Dog Walk. Along with Obedience & Rally, you are likely to find Weave Poles & a Tunnel or two at our practices. Dog Agility Is a sport in which a handler Is given a set amount of time to direct an off-leash dog through an obstacle course. The sport is very exciting. Doth to watch and participate In, and It helps build a bond between dog and handler that reaches far beyond the confines of the ring. Canine Agility has become tremendously popular since its 1979 debut as an entertainment for spectators at the Crufts Dog Show. It's currently the most rapidly growing dog sport in England, Western Europe and North America. Champions come in all shapes and sizes, from the Great Dane to the Jack Russell Terrier to every hound, herder and mutt in between. Small dogs compete against small dogs, large dogs against large dogs. Dog Agility courses were originally modeled loosely on equestrian stadium jumper courses and consisted largely of jumps that combined height, breadth and proximity to each other to establish levels of difficulty. But during its evolution the sport has developed unique obstacles -- hoops, weaves, tunnels, to name a few -- and Its scoring systems and performance ideals are today very much its own. In the United States, any of several national agility-focused organizations can sanction tests (called "trials") held by local dog training clubs. International rules and specifications govern the trials, which demand extreme canine Agility in terms of speed, obstacle-related athleticism, and focus on a handler's on-the-spot instruction.